Walter Carpenter has served as a park attendant at the Waterbury Reservoir since 2008. During that time, he's developed new strategies for managing the 40,000 or so people who visit the day-use state park every summer. For the 40,000 or so visitors that go to the Waterbury Reservoir every summer, the 850-acre body of water has become a go-to oasis on hot summer days. But managing all that traffic, it turns out, is no simple task. On a recent Tuesday morning, about a half hour after entry gates opened at the reservoir, temperatures were already hitting the high 70s and the place was filling up fast. A group of young women splashed and played and screamed in waist-deep water, about 20 feet out from a narrow sand beach. 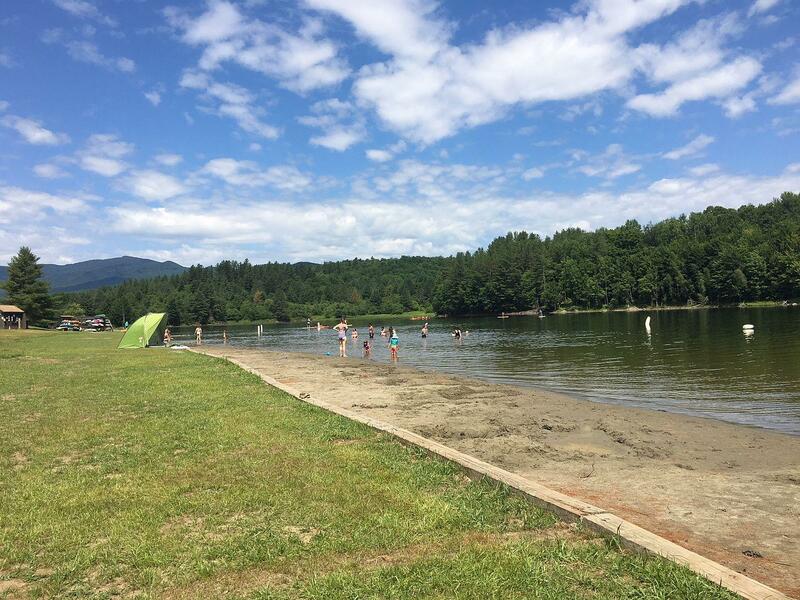 A busload of kids from a nearby summer camp was wading around a little closer to shore. It was an idyllic Vermont scene, the kind of picture they might use for the month of July if the Department of Tourism made one of those photo calendars you hang on the wall. But nothing good is easy, as the saying goes. And a guy named Walter Carpenter is working especially hard to keep the place humming. Walter Carpenter is known at Waterbury Reservoir as "Walter the Survivor." 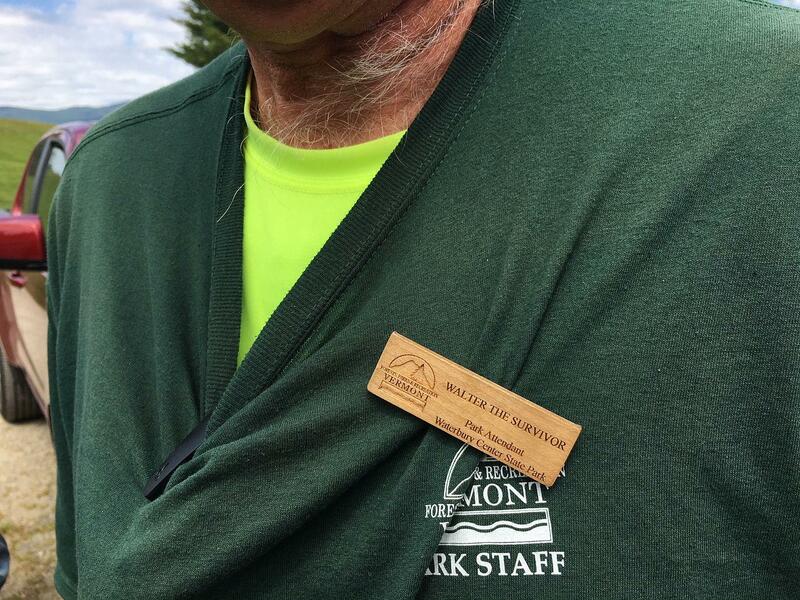 His nametag literally says, "Walter the Survivor." Carpenter is known here as “Walter the Survivor.” His nametag literally says, "Walter the Survivor." “Because I’ve survived down here for 10 years, or 11 years now,” Carpenter explained. That’s a relatively long tenure for a park attendant, the role in which Carpenter’s served in since he began working here. And that time has given Carpenter the experience needed to hone his craft. Waterbury Reservoir park attendant Walter Carpenter earned the nickname "Walter the Survivor," due in part to his long tenure there. Carpenter said one of his biggest revelations came a few years into the job, when he realized diagonal parking would allow him to position arriving vehicles tighter together, and also make ingress and egress more efficient. “Sometimes they’ll have a mind of their own and they’ll park wherever they want to, and then I have to go move them,” Carpenter said. Originally built as a flood control project in the 1930s, the Waterbury Reservoir has since become one of the most popular day-use state parks in Vermont. With hundreds of people coming in and out of the park on a daily basis, Carpenter said the most critical skill set is a keen understanding of humanity itself. “And I have to be a combination policeman, guide, brother, sister, mentor, psychologist, psychiatrist,” he said. Carpenter’s broken up fights, corralled overly rowdy kids and managed countless disputes at the boat ramp. He’s 62 years old, and this stint at the reservoir is the latest in a long line of tourism industry jobs. He got into the business in 1980, after a late-night run in with a ski resort worker at a dive bar in New Hampshire. “And he was a drunk as I was, probably drunker. And he was a big redneck. He, you know, started yelling at me for being a college grad and said college grads don’t know how to work. They all want things handed to them,” Carpenter said. When Carpenter objected, the man said to prove him wrong by showing up to work at the mountain the next day. “I made it, despite the hangover that I had,” Carpenter said. On that first day as a liftie, Carpenter said he realized he loved the job — loved making people feel welcome, loved helping people when people needed help. “I seem to have a talent for it … And I seem to have a knack for it,” Carpenter said. On hot summer days, hundreds of people come to the Waterbury Reservoir to cool off in the water. Carpenter is always working when he’s here. On sunny days especially, there is no down time. And the regulars, like Margaret and David Luce, appreciate his diligence. The Luces live a couple miles away and come here frequently to canoe or kayak. They love the loons, the clean water, the gorgeous scenery. And, they love Carpenter. “I think his feet have grown roots here, you know?” David Luce said. “In the terrible heat that we had, he was all covered up, you know, so he wouldn’t get too much sun," she said. "And I thought, 'Oh my gosh, what dedication.'" For Carpenter, the tourism industry is a calling. He no longer mans the ski lifts in winter, but he’s still working on the mountain, as a cafeteria worker at Mad River Glen. Carpenter is also an activist for universal health care and spends much of his off time during the winter in legislative committee rooms in the Statehouse. Carpenter said the state parks department treats him and other workers at the reservoir well. But he worries his vocation doesn’t always get the respect it deserves. “I think the state needs to re-evaluate its people on the front lines of the tourist industry, which is such a vital component of the state's economy — and the state's soul,” Carpenter said. Spend a day with Carpenter, and people might re-evaluate their preconceptions about the job. He’ll no doubt be at the reservoir if you go, and guaranteed he’ll make time to talk. Many of us share a connection with a river, lake, stream or pond. Throughout the summer, listen to VPR to hear personal stories from Vermonters about how bodies of water around the state affect their lives, and how they've seen them change over time. Tweet @vprnet to share your favorite bodies of water in Vermont. An international border divides Lake Memphremagog in Vermont’s Northeast Kingdom. And for the last seven summers, a group of marathon swimmers have challenged that border and themselves. South Pond, in the Windham County town of Marlboro, is only open to town residents. That means during the summer, South Pond is the village green, the playground and the town pool. It’s where families share potlucks and people come to unwind, exercise and re-energize.